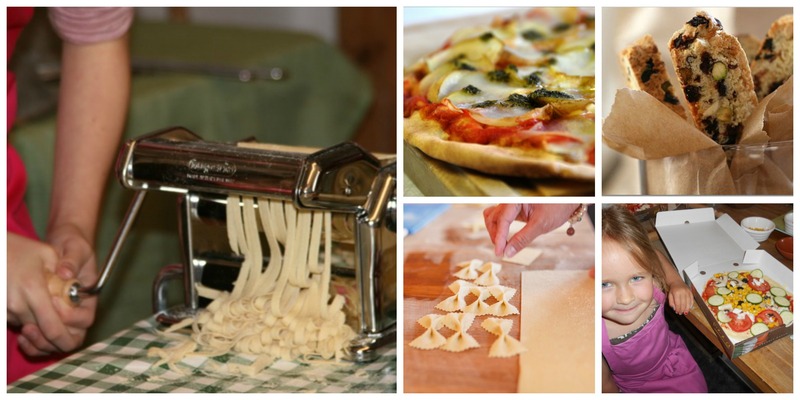 Pasta workshops are £9 per child. They make the pasta dough from scratch before rolling it out with traditional-style pasta machines and being shown how to make 3/4 different shapes of pasta which we then package up for them to take home with instructions on how they made it, how to store it and how to cook it. Pizza workshops are £10 per child. They make the pizza dough from scratch before rolling it out and choosing from a wide selection of toppings. They then take their pizzas away to cook at home in traditional-style pizza boxes. At the pasta parties they do the same thing as above, however we cook and serve one of the shapes of pasta with an authentic Italian sauce and fresh bread. Soft drinks and themed invites are included in the price of £16 per head. At the pizza parties again they take their pizza home with them but we make and cook larger pizzas which are served for lunch/tea, again with bread plus carrot and cucumber sticks. Soft drinks and themed invites are included in the price of £16 per head. Our philosophy is to source the very best products that Italy has to offer, using small, individual providers whose passion and quality are very much in evidence. We have flavoured olive oils and balsamic vinegars, pasta and sauces, liqueurs, wine and prosecco and gifts including olive wood, leather goods and ceramics.